Acidity and alkalinity are expressed on the pH scale which ranges from 0 which is strongly acidic to 14 which is strongly alkaline. A pH of 7.0 is neutral. Normal blood is slightly alkaline with a pH ranging from 7.35 to 7.45. All the foods we eat affect our pH levels because food is either acid or alkaline. 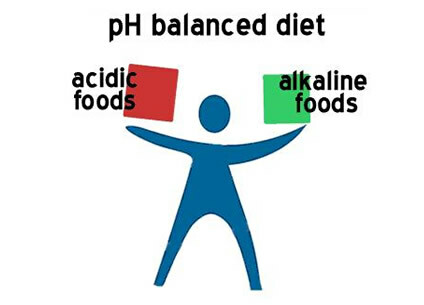 In order to maintain pH balance, the body tries to neutralize any extra acid through urine elimination. When the foods we choose are continually acid in nature, it can overwork this safety procedure. Balancing your pH is widely known to be the single most important thing you can do for your health. If your pH levels shift too far in either direction (higher than 7.8 or lower than 6.8), cells become poisoned by their own toxic waste and they die. This imbalance in the blood pH can cause serious health issues and lead to the progression of degenerative diseases including excessive systemic weight gain. The excess acid that your body cannot neutralize or eliminate gets stored in your body fluids and cells. Acid in your cells is not a good thing because it restricts enzyme reactions and changes metabolism and the end result is that it stops weight loss. In other words, acid overload does restrict weight loss. However, by increasing your intake of fresh fruit, veggies and healthy nuts, and decreasing your intake of grains, meat, and refined white sugar, you will find it much easier to lose weight. If you are presently struggling to take weight off and it seems as though you’ve stalled, you should take a close look at your pH balance. It’s important to understand also that acid generating food is different from acidic foods. For example, lemons are acidic before you eat them but once digested and absorbed into the body they are alkaline. Diet is one thing that needs attention if you are to balance your pH levels but stress is another contributing factor that produces free radicals that cause damage to the body’s cells. The by-product of this destruction causes the cellular environment to be acidic. So, avoiding stress as much as possible is another key to keeping your pH healthy and balanced. Toxic overload is another issue that can contribute to acid imbalance. As the body becomes more acidic it sets up defense mechanisms so that the acid cannot enter vital organs by building fat deposits and packing the excess acids within in order to protect vital organs from the effects of these acids and toxins. There are certain things you can do that will help to maintain your pH balance. Exercising daily helps to counter the stress and negative reaction of the body’s pH. Eating more alkaline generating foods such as fruits, veggies, almonds and whey protein. Eat foods raw when possible or gently steam or boil them. Acidic environments also cause minerals such as sodium, calcium potassium and magnesium to leach out from vital organs and bones in order to buffer and neutralize pH. Since many of the fruits and veggies we eat are no longer grown in mineral rich soil you can also consider taking some form of mineral supplement. Balancing your pH is the first step you need to take so that your weight loss program can work its wonders and be more effective. Take my 60 second test to find out how you fare on the weight loss resistance scale. If you’d like to reduce your resistance the first thing you need to know is how resistant you are right now! Most people don’t have the faintest clue where they stand, but by taking this test you’ll get an immediate answer.